Do you agree with the person, maybe feel sorry for them? Is life being unfair and picking on them in some way? We all know life’s unfair. None of us are exempt from curveballs being thrown our way. Let me share how this new thought pattern has worked to my advantage in life and specifically in sales. If other people can have success, recognition, make money doing what they love, why can’t I as well? I know I’m not exempt from the bad stuff happening so it only makes sense I’m not exempt from the good stuff too, right? Many years ago I was assigned a project to complete a college business class. While working with a partner, we had to find a company in our community and put together an extensive presentation outlining their processes and procedures for each department. One of the stipulations was we weren’t to know anyone at the company ahead of time. To our good luck, my partner had a sister in the Chamber of Commerce with a man who owned and ran one of the largest companies in our community. The company was Boxlight, a multi-million dollar audiovisual company located in Poulsbo, WA. The owner agreed to allow us access to his department heads, however, we had to get each department head on the phone, schedule a time to go to their office and interview them. It took weeks to get these appointments set, interviews done and then weeks to compile our information into the presentation for the class. It was one of the largest and most time-consuming projects I had ever done for a college class. One of the departments I focused on was Human Resources and specifically their hiring practices. As a prop for the presentation, I showed an ad Boxlight had placed in the local paper for Sales Representatives. At the end of our presentation, one of my fellow classmates asked if he could have the ad. He applied for a job and got hired. A few weeks later another one of my classmates applied for a job in sales at Boxlight and was hired. I thought to myself, “If Boxlight hired them, why wouldn’t they hire me?” So I applied and a few months later was hired into my first corporate sales job which led to a successful 17+ year career in the Technology Field. 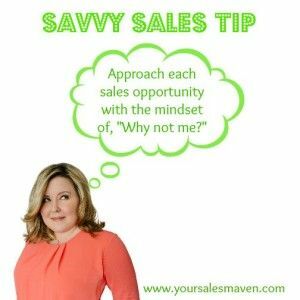 This mindset of “Why not me” has served me time and again in my sales career. Your Savvy Sales Tip this week: Approach each sales opportunity with the mindset of “Why not me?” If you’re willing to work hard and earn the customer’s business, you’re as deserving as your competitor. 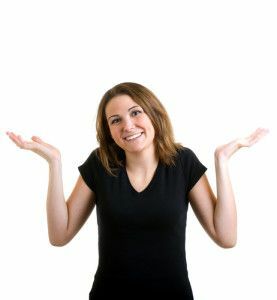 In my sales coaching I work with many people who are walking away from business because their pattern of thinking is “Why would they buy from me?” instead of “Why wouldn’t they buy from me.” Helping them switch this limiting thinking pattern to one that’s more productive makes a big shift in what’s possible for their business. So I ask you, why not you? What do you have to lose by challenging yourself and believing you’re as deserving as anyone to earn the sale, close the deal, or anything else you want to accomplish in sales and in life? Allow for this thinking pattern to be present before your next sales presentation or cold call.